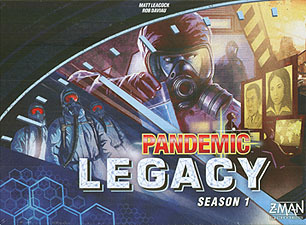 Pandemic Legacy - Season 1 is a unique and epic cooperative game for 2 to 4 players. Unlike most other games, some of the actions you take in Pandemic Legacy will carry over to future games. What's more, the game is working against you. Playing through the campaign, you will open up sealed packets, reveal hidden information, and find the secrets locked within the game. The clock is ticking and you will only have two chances to win in a month before moving to the next. Characters will gain scars. Cities will panic. Diseases will mutate. No two worlds will ever be alike! What results is a year that will never be forgotten. This is no ordinary virus. This no ordinary year. Your team will see things, live things, do things that might just save humankind from being snuffed out completely. The results of this year will be spoken in whispers for generations. Can your team save humanity? Can your team make it through the year? Can your team face month after month of surprises, set backs, and fleeting victories? Are you prepared for Pandemic Legacy? Reference Cards, Rulebook, and Much More! Without putting too many spoilers If you love regular Pandemic then you will love Pandemic Legacy. A stressful rollercoaster of a game but worth every penny! Buy it now!